High quality pellets made especially for guinea pigs and grass hay for fiber should make up most of a guinea pig's diet, but for optimal guinea pig health, you should give small amounts of fresh veggies daily. Leafy greens, which contain the vitamin C that piggies lack, should make up most of their veggie diet. Kale, spinach, parsley, turnip greens, mustard greens and romaine lettuce are good choices. Guinea pigs can eat most of the vegetables humans eat. Colorful veggies are packed with nutrients -- red, yellow, orange and green sweet peppers, sweet potatoes and yams, zucchini, turnips, pumpkins, corn with silk cut into small pieces, and snow, sugar and snap peas. 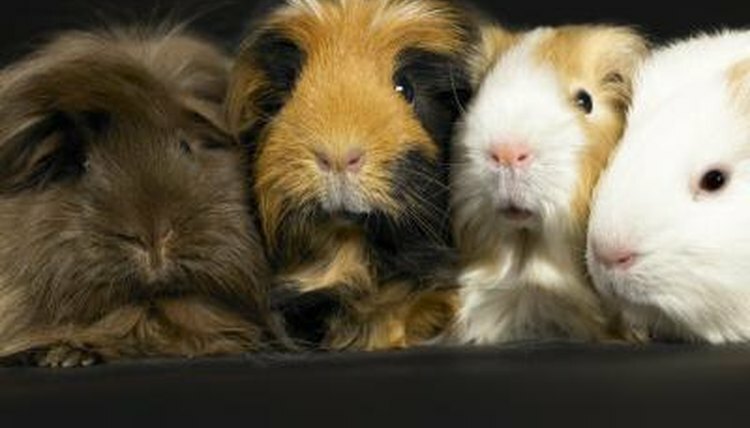 Veggies that cause gas or burping in humans will have the same effect on guinea pigs. So give bok choy, collard greens, broccoli, cauliflower and cabbage sparingly. Look for burpless varieties of cucumber. Certain veggies don't agree with guinea pigs, and some can be harmful. Avoid raw and dried beans and lentils, white and red potatoes, onions, garlic, rhubarb, hot peppers, mushrooms, iceberg lettuce and all processed foods. Guinea Pig Lane: What Can My Guinea Pig Eat?